Last week Namco Bandai quietly released the English version of classic 1995 JRPG Tales of Phantasia onto iTunes. It's just like the fully-voiced PSP version of the game, only with sloppy touch controls, in-app purchases, fewer save points and an always-online requirement. Can we not do this? I am all for publishers bringing classic games to mobile devices. Why should the emulation crowd have all the fun? 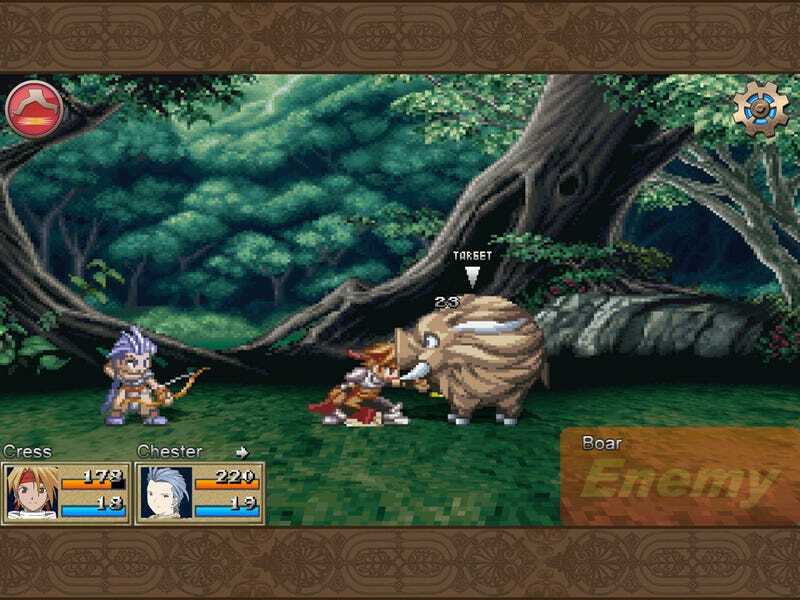 It's easy enough to take a game like Tales of Phantasia, tweak the controls, maybe add in some simple new features and release it unto the world anew. Just make sure the added features are the ones players want. An always-online requirement is not one of those features. In order to play Tales of Phantasia on iOS, you have to be connected to the internet. The game will not play or save without an active internet connection. It's constantly querying the network, which means your iPhone, iPad or iPod Touch is using more juice (and bandwidth) than it should. What are the benefits of an online requirement for a single-player role-playing game? Well, there's the login bonuses. That, and it helps ensure no one abuses the game's in-app purchase system. We're introduced to in-app purchases during the game's first mini boss fight. A wild boar appears and completely decimates the two-man party. But wait, Maria gave players a Miracle Orb, a special item that allows them to resurrect in mid-battle with greatly-enhanced stats! Some players — experienced players — might have no problem navigating the game without resorting to purchasing power-ups. They'll have no issue with the incredibly over-sensitive, untweakable movement controls. They'll acclimate themselves to the odd battle system, which asks the player to touch certain portions of the screen to perform certain attacks, but does not clearly indicate those portions on the display. Those players will be fine. Everybody else, hold on to your wallets. Nearly two decades later, Tales of Phantasia is still an amazing game. Control issues aside, I'd gladly play a premium price for an offline version of this port. But that's not what we've got here. Namco Bandai has taken a beloved classic and twisted it into something borderline evil. Let's hope they aren't planning to make a habit of it.